Several prominent public voices have advanced the hypothesis that networked communications erode the value of privacy in favor of a transparent connected existence. Especially younger generations are often described as prone to live "open digital lives". This hypothesis has raised considerable controversy, polarizing the reaction of its critics as well as of its partisans. But how likely is the "end of privacy" ? Under which conditions might this scenario come to be ? What are the business and policy implications ? How to ethically assess risks and opportunities ? 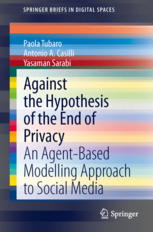 To shed light on the co-evolution and mutual dependencies of networked structures and individual and collective strategies towards privacy, this book innovatively uses cutting-edge methods in computational social sciences to study the formation and maintenance of online social networks. The findings confound common arguments and clearly indicate that Internet and social media do not necessarily entail the end of privacy. Publicity is not "the new norm" : quite to the contrary, the book makes the case that privacy is a resilient social force, resulting from a set of interconnected behaviors of Internet users. Paola Tubaro is a senior lecturer at the Business School of the University of Greenwich in London, UK, and an associate researcher at Centre Maurice Halbwachs (Centre National de la Recherche Scientifique), Paris, France. She is a specialist in social and organizational network analysis. Antonio A. Casilli is an associate professor at Telecom Paristech (Institut Mines-Télecom) and a researcher at the EHESS (School for Advanced Studies in Social Sciences), Paris, France. His latest book is Les liaisons numériques (Digital relationships), Seuil, Paris, 2010. Yasaman Sarabi is a doctoral candidate at the Business School of the University of Greenwich in London, UK. Her research is focused on business network analysis of multinational private water companies.